1. Africa is, and will continue to be, one of the fastest-growing economic regions in the world, thanks to surging demand both from abroad (from China and India in particular) and at home (fuelled by urbanization and consumerism), according Pratibha Thaker of The Economist magazine. Including Northern Africa, the continent’s star performers are expected to be South Africa, Egypt, Algeria, Botswana, Libya, Mauritius, Morocco and Tunisia. Collectively, these countries match the average GDP per head of the BRICS, according the Adrian Wooldridge of The Economist. Africa will grow by 4.8 percent—the highest rate of growth outside Asia, and higher than even the much-talked-about economies of Brazil, Russia, Mexico, and Eastern Europe, according to newly revised IMF estimates. The continent was one of only two regions—Asia being the other—where GDP rose during 2009’sglobal recession, according to a recent report by the McKinsey Global Institute. 2. Telecoms, banking, retailing, manufacturing and even agriculture will be the the region’s fastest growing sectors: Agriculture, an area where the continent has long lagged, is poised for takeoff. The continent is home to 60 percent of the world’s uncultivated arable land. The region will see an increase in the buying or leasing of cheap agricultural land by outsiders. Food-importing countries poor in land and water but rich in capital, such as the Gulf States, and countries with large populations and food security concerns, such as China, South Korea and India will be at the forefront. 3. 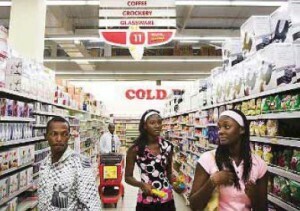 Africa’s consumer market will account for the region’s largest growth. The continent’s burgeoning domestic market is the largest outside India and China. In 1980, just 28 percent of Africans lived in cities. Today, 40 percent of the continent’s 1 AFRICA IN THE GLOBAL MARKETPLACE AFRICA IN 2011 Ten Essential Market Trends for the Global Manager billion do, a portion close to China’s, larger than India’s, and likely to keep growing in the coming years. The number of households with discretionary income is projected to grow 50 percent over the next ten years to 128 million, according to Foreign Policy magazine. And consumer spending in Africa is growing two to three times faster than in the wealthy developed countries and could be worth $1.4 trillion in annual revenue within a decade. On a per capita basis, Africans are already richer than Indians, and a dozen African states have higher gross national income per capita than China, according to development expert Vijay Majahan, author of the 2009 book Africa Rising. In the last four years, the surge in private consumption of goods and services has accounted for two thirds of Africa’s GDP growth. The rapidly emerging African middle class could number as many as 300 million, out of a total population of 1 billion. While few of them have the kind of disposable income found in Asia and the West, these accountants, teachers, maids, taxi drivers, even roadside street vendors, are driving up demand for goods and services like cell phones, bank accounts, upmarket foodstuffs, and real estate. 4. Rapidly expanding, Africa’s youthful workforce will be a key advantage. With more than 60 percent of the population below the age of 25, Africa has an advantage: it has a wealth of cheap labour, making it most inviting to businesses that are labourintensive. By 2040, the continent is expected to be home to 1.1-billion working-age people, more than either China or India, and is poised to become a serious engine of production and consumption. While African countries have abundant labour, however, much of it is unskilled. That said, pools of highly educated human resources are readily available, but they tend to lack practical management experience. Therefore, skills training and development is a critical area of need; as is the sourcing of trainers to transfer skills to local talent. Scarcity of jobs means that the sheer press of applicants can make identifying the right people difficult. Wal-Mart, the world’s biggest retailer, made a $4.6 billion (32 billion rand) offer on September 27th to acquire the South African retail chain, Massmart Holdings. If it goes through, the acquisition will represent the American retailer’s biggest acquisition in an emerging market and the first by a global retail chain in South Africa. Wal-Mart International CEO Doug McMillion recently announced that Wal-Mart is looking to expand internationally to supplement weakness in domestic sales. Massmart Holdings Ltd. is a South-African based management group that is the third largest distributor of consumer goods in Africa, a leading retailer of general merchandise and a wholesaler of basic foods. 5. Smart phones will be the fastest growing category of handsets, even in the poorer areas, where they often serve as a substitute for PCs. Mobile phone use is growing faster in Africa than anywhere else in the world. It is the only continent in the world where mobile phone revenues are higher than fixed line. Today, cellular phones are the continent’s lead form of communication. GSM service is pervasive and due to low costs, text messaging has become a medium of choice in both business and social communications. Democratic of Congo, Tanzania and Zambia, and strong agricultural economies, including Ethiopia, Kenya and Malawi, will benefit from rising demand and should achieve economic growth of 5% and above in 2011.The continent’s production of oil, gas, minerals, and other natural resources is projected to grow at 2 to 4 percent per year for the next 10 years. At current prices, this will raise the value of resource production to $540 billion by 2020—and possibly much higher depending how commodity prices rise. 8. Ghana is expected to become the sub-Saharan region’s fastest growing economy in 2011, with growth expected to reach double digits. As oil comes on stream in significant quantities (first official pumping began Dec. 15, 2010) for the first time, the influx of money will pose a difficult test of institutional accountability. Will Ghana use its new-found oil wealth more wisely than the others have done? Despite promises from the country’s leaders, this remains to be seen. Considering neighbouring countries, Ghana’s democratic record is still among the best in West Africa. 9. South Sudan is likely to become Africa’s newest country in a January 2011 referendum. Additionally, Africa’s democratic credentials will be tested during 2011, as several sub-Saharan states plan to hold elections. Nigeria—the region’s most populous country, largest oil producer and second-biggest economy after South Africa—elects a new president and legislature. Other sub-Saharan states that plan to hold elections include, in rough chronological order: Benin, Uganda, Chad, Madagascar, Zambia, Cameroon, the Democratic Republic of Congo, Liberia and Gabon—and in January southern Sudan is due to hold a referendum on independence. Rwanda is also leading Africa in the ICT Revolution: Rwanda is set to become sub-Saharan Africa’s hub for information and communications technology (ICT).Named East Africa’s number one ICT nation by the United Nations Conference on Trade and Development (UNCTAD), Rwanda has benefited from ICT-based investments by lucrative international players such as Microsoft, Nokia, and Terracom. New infrastructure connecting Africa to the rest of the world will boost bandwidth, cut costs and stimulate businesses that rely on technology. This includes the recent arrival of new submarine fibre-optic cables and satellites. Many high capacity international backbone network projects have been built to connect Africa to the rest of the world on an open access basis. Algeria, Botswana, Mauritius are also implementing projects to become ICT regional hubs. According to the Economist magazine, the biggest concentration of overlooked markets is in Africa (which is in many ways an overlooked continent). Pockets of great risk and instability certainly remain, but the long-term trends look good. In 2011 an increasing number of companies, looking at the West’s flat markets, will decide that volatility is at least a sign of life. Companies that move first will enjoy lots of advantages. They will be able to forge deals with aggressive young companies: companies such as Angola’s Banco Africano de Investimentos, which is expanding in Europe and Brazil, and Egypt’s Orascom Telecom, which is expanding across the Middle East and beyond. They will be able to strike infrastructure deals with local governments. And they can shape the tastes of future consumers. Columnist, Erika Amoako-Agyei, is an international business consultant and the owner and founder of a computer hardware and software consultancy that provides IT and business planning services to corporate clients in West Africa’s mining industry. She is based in the US and provides cross cultural management and communications training to global firms and expatriate professionals entering into Africa. She keeps a blog at www.AfricaBusinessReview.net and can be reached by email at: erikaagyei@gmail.com.